"The goal of the EquipmentWatch awards program is not only to help equipment buyers objectively understand the best performing machines," says Garrett Schemmel, vice president, EquipmentWatch. Manufacturers taking home numerous awards from multiple years for the same series include: Doosan DX300 (2x LCO for Excavators Crawler Medium), Bobcat S70 (2x LCO for Loaders Skid Steer Small), Case 580 (2x HRVA for Backhoes), Snorkel TB (2x HRVA for Boom Lift Telescopic), Case IH Axial-Flow 140 (2x HRVA for Combines), Deere 800 (2x HRVA for Excavators, Crawler Large), and Deere 8RT (2x HRVA for Track Tractors), and Caterpillar 720 (2x HRVA for Rear Dumps). "The goal of the EquipmentWatch awards program is not only to help equipment buyers objectively understand the best performing machines," says Garrett Schemmel, vice president, EquipmentWatch. "The program is also designed to recognize manufacturers for building these higher quality, durable, and cost-friendly machines that power our industry. We're proud to announce our 2019 award winners – all of which represent world-class products." Lowest Cost of Ownership Awards: Outstanding OEMs in 2019's Lowest Cost of Ownership Awards include Deere taking the lead with four total awards, Caterpillar with two awards, Komatsu with two awards, Volvo with two awards, and Bobcat with two awards. 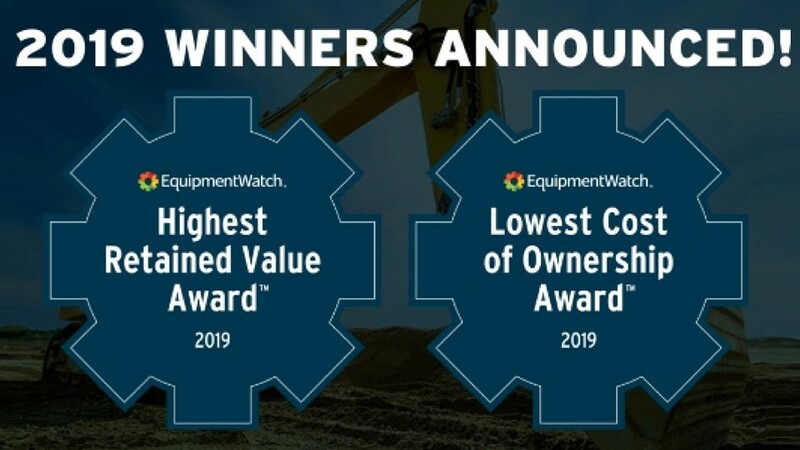 LCO Award winners are determined by EquipmentWatch Costs analysts, who looked at the most popular equipment series observed on the resale channel over a 12-month period in 2018. Series without a model in current production in North America were removed. Only equipment series which consist of at least one model were considered. Highest Retained Value Awards: Outstanding OEMs in 2019's Highest Retained Value Awards include Caterpillar taking the lead with four total awards, Deere with three awards, Case with two awards, and Komatsu with two awards. HRVA winners are determined by EquipmentWatch Values analysts, who looked at the most popular equipment series observed on the resale channel in 2018. Series without a model in current production were removed. Only equipment series which consist of at least one model contained in the EquipmentWatch Residual Values software were considered.